Miranda Kaufmann: Historian, Journalist, Raconteuse. Three ways of saying the same thing- I like telling stories. I also like digging for the truth. Or as near to it as anyone is likely to get. Because the best stories are true stories. As a historian, I've found evidence of over 360 Africans in Renaissance Britain, worked with the National Trust and English Heritage and contributed entries to the Oxford Companion to Black British History and the Oxford Dictionary of National Biography. As a freelance journalist, with experience at the BBC and The Sunday Times, I irregularly write book reviews, and have written about everything from strange books in the Bodleian Library to the joys of women's rugby. My first book, Black Tudors: The Untold Story, was published by Oneworld in October 2017. The TV rights were optioned in 2017 by Silverprint Pictures and the book was shortlisted for the Wolfson History Prize and the Nayef Al-Rodhan Prize in 2018. I'm excited to be revisiting the themes I explored with English Heritage back in 2007 as the lead historian for the Colonial Countryside project, looking at connections between National Trust houses, Caribbean slavery and the East India Company. I'm currently conducting research for my next book, Heiresses: The Caribbean Marriage Trade, which will be published by Oneworld. Have a look round my site, where you can find my blog, videos, podcasts, latest news and my published articles. Then do drop me a line and let me know what you think! I love spreading the word about my work. I've spoken at the British Library, the National Archives, the Department for Education, the National Trust's Sutton House (above) and various universities, schools, and local libraries. Saturday 6th July Teaching Black Tudors:bringing untold stories into the History classroom, Schools History Project Conference, Leeds. For more details of my upcoming and recent talks, click here. The story of Edward Swarthye the Black Tudor who whipped an Englishman in 1590s Gloucestershire, featured in my book, Black Tudors: The Untold Story, was covered in The Times and The Daily Mail after I spoke about him at the Oxford Literary Festival. The story of black migrants in England in Tudor times: a short video for BBC Bitesize that I made with David Olusoga. I contributed this page on African freedom in Tudor England: Dr Hector Nunes’ petition to the Runnymede Trust's new Our Migration Story website. In this Introduction from the first "What's Happening in Black British History?" event, held at the Institute of Commonwealth Studies on 30th October 2014, Michael Ohajuru and I explain why we put the series together- I'm on for ten minutes from 6 mins in: ​You can read more about the event in my blog report. ​My entry on John Blanke (fl.1507-1512) for the Oxford Dictionary of National Biography. I wrote the letters to Tudor and Georgian Londoners for the Influential Black Londoners exhibition at the National Trust's Sutton House in Hackney in 2013. Back in 2007, I researched English Heritage properties' links to Slavery and Abolition. This is an interview with The British Academy in relation to being shortlisted for the Al-Rodhan Prize. I was interviewed about Black Tudors by Bidisha for The Guardian. Here's another interview with Natalie Anderson for Medievalists.net. I was interviewed by Sky News and The Observer in relation to calls for Solomon Northrup's 12 Years A Slave to be on the national curriculum, and British links to slavery. I'm working with secondary school teachers to get Black Tudors into the classroom. What's Happening in Black British History? X will take place at the University of Leicester on Thursday 2nd May 2019. I'm excited to be the Lead Historian on the Colonial Countryside project, looking at connections between National Trust houses, Caribbean slavery and the East India Company. I reviewed Temi Odomusu's BLACK JOKES, WHITE HUMOUR: AFRICANS IN ENGLISH CARICATURE, 1769–1819, for Slavery and Abolition journal. I spoke with Rex Obano about his Radio 3 play, The Moors of England. I've got a new book deal! Heiresses: The Caribbean Marriage Trade will be published by Oneworld Publications. 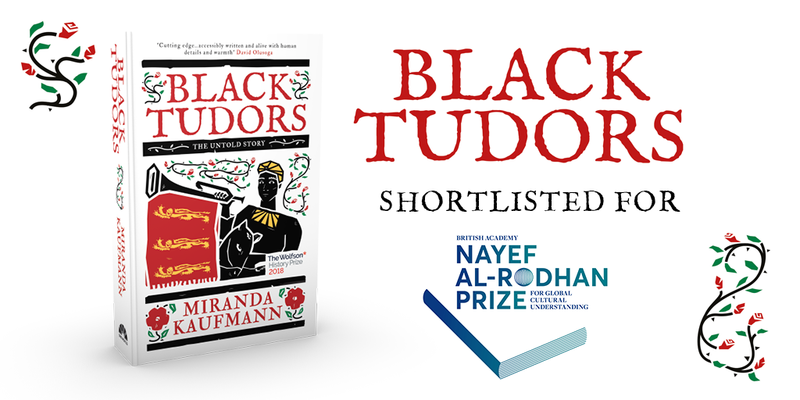 Black Tudors: The Untold Story was shortlisted for the 2018 Nayef Al-Rodhan Prize! 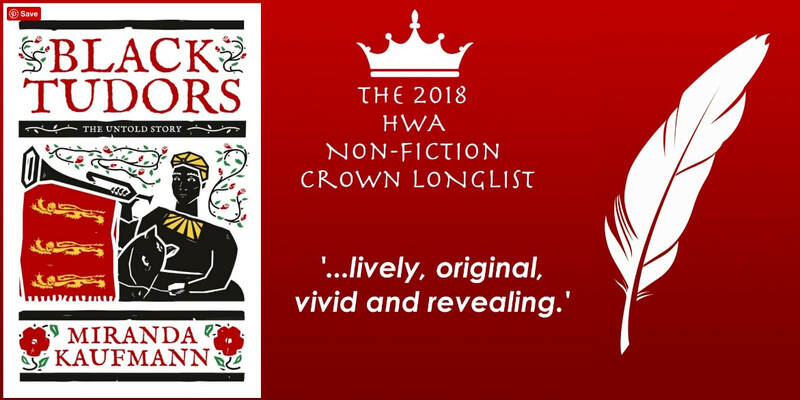 Black Tudors: The Untold Story was longlisted for the HWA Non-Fiction Crown! Black Tudors: The Untold Story was shortlisted for the 2018 Wolfson History Prize! Listen to my interview about Black Tudors with Tyler Yank for New Books Network. Dr. Miranda Kaufmann explains how she reconstructed the stories of black men and women who lived in London during the 16th and 17th centuries by searching through the parish records and registers. Listen to my interview on Resonance FM's Very Loose Women Revamped: Dr Miranda Kaufmann joined us live on air to discus her research into the history of Africans living in Renaissance London.